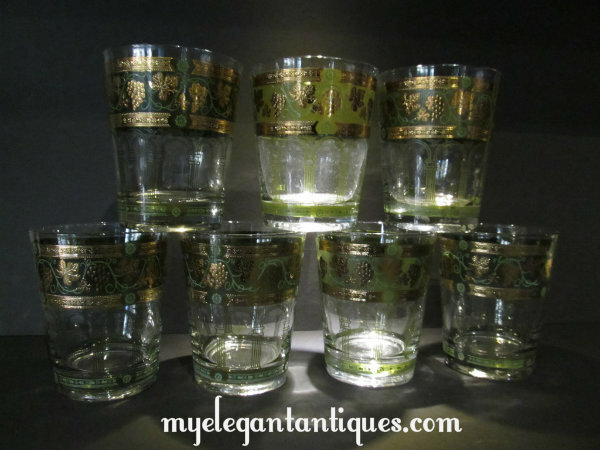 Here is a gorgeous signed barware set of 6 (+1) vintage Cera 16 ounce double high ball glasses with 22k gold decoration. 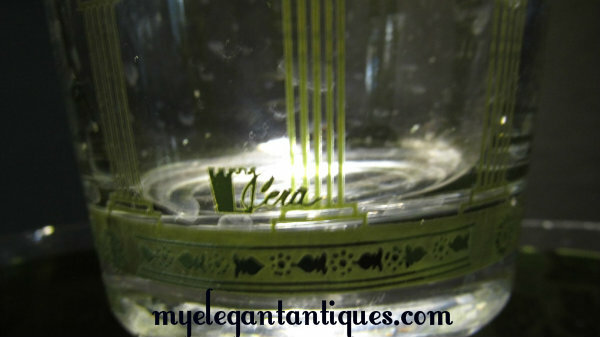 These beauties are from the 1930's or the 1940's, and each is signed Cera on the bottom. The design on these high balls is amazing. 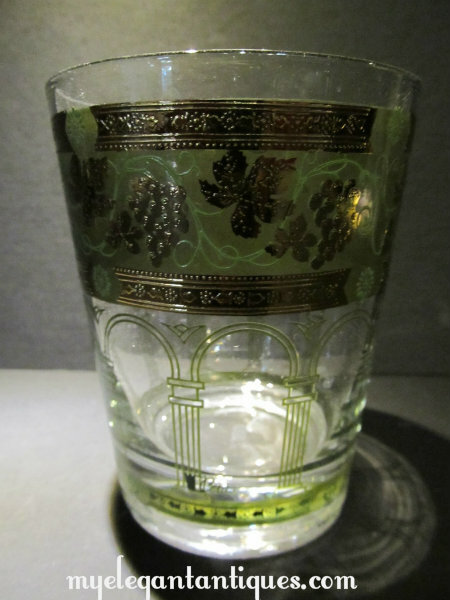 A heavily encrusted gold grapevine design set against a rich green band wraps around each glass at the rim. There is also a repeating pattern of green doric columns that wraps around the base of the glass -- this architectural feature is quite striking! The gold enamel in the grapevine design creates a rich texture across the top of the glass. 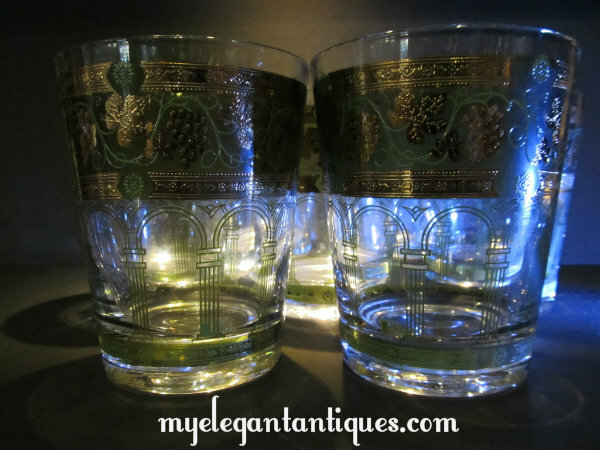 The bottoms of the highballs are weighty and thick, which was a trademark of Cera Glassware. This pattern was known as "Golden Grapes". Cera also produced sets with a green or maroon background. There is no usage wear on the rims, or on the amazing green and gold grapevine design, nor on the doric columns. In fact, these glasses look as if they were used very little. Each of our Cera Golden Grapes double highballs is in mint condition with no chips, cracks or wear to the gold. Nor are there any chips cracks, repairs or haziness to the glass itself. The colors are all vibrant and the design is crisp. 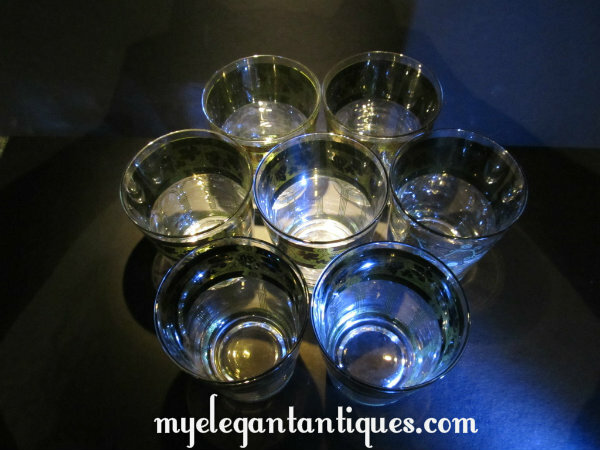 These highballs stand 4-3/8" in height and measure 3-6/8" in diameter at the rim. To maintain the beauty of these glasses, or of any good glassware or crystal, do not clean in the dishwasher. Use only mild soap and water, and dry with a soft cloth. These glasses are so elegant! Between the satisfying weightiness of the base and the rich decoration on the glass itself, these double highballs are immensely satisfying to drink from!